path-capacity Created with Sketch. Castle Created with Sketch. Combined Shape Created with Sketch. Fill 1 Created with Sketch. icon-facebook Created with Sketch. Combined Shape Created with Sketch. path-heart Created with Sketch. icon-instagram Created with Sketch. Icon/Vector/lighthouse Created with Sketch. Page 1 Created with Sketch. Combined Shape Created with Sketch. path-private Created with Sketch. Icon Quirky Created with Sketch. ======= >>>>>>> c6238e9a... add things to do icon icon-twitter Created with Sketch. icon-youtube Created with Sketch. In an increasingly cashless society it can be hard to donate your pennies – so we’ve put contactless payment technology into two of our most historic sites. We’re delighted to have partnered with Bank of Scotland and VISA to bring contactless to the Trust. We’ve created beautiful replicas of a couple of the Trust’s most famous artefacts to bring contactless to two of our historic locations. The replicas include a 200-year-old bust of Robert Burns at the Robert Burns Birthplace Museum in Ayrshire, and a historical painting of Colonel William Gordon at Fyvie Castle in Aberdeenshire. Visitors can now simply tap their card on the artworks to make a £2 donation to the Trust and help preserve Scottish heritage for generations to come. Please do touch this art! Step inside the modest cottage where national bard Robert Burns was born in 1759, and where the first-ever Burns Supper was held. You can see where Burns and his family lived, side by side with their farm animals, and where he got his earliest schooling. It’s in these rooms that you can find our crafted replica of an original bust of Burns, and tap to donate to preserve this historic site for future generations. The replica is of a plaster bust of Robert Burns sculpted by David Watson Stevenson in the 19th century, with a few tweaks of our own. Fyvie Castle is a magnificent fortress in the heart of Aberdeenshire, and the home of our second replica. Ghosts, legends and folklore are all woven into Fyvie’s 800-year-old history, with Charles I, William the Lion, and Robert the Bruce amongst Fyvie’s royal guests. 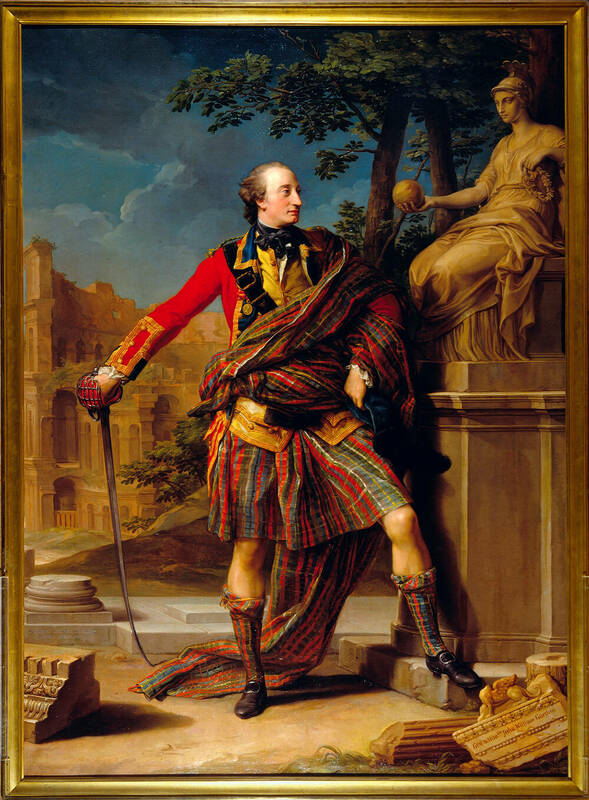 Its newest guest is our replica of a famous portrait of Colonel William Gordon, painted on his Grand Tour in 1766 by Italian artist Pompeo Batoni. The picture depicts Gordon as a swaggering Scotsman in the guise of a Roman hero, standing before the ruins of the Colosseum. Our replica is as close as possible to the original – with a few additions of our own. Can you spot them? Creating these replicas has been a mammoth collective effort, bringing together experts across conservation, design, art and banking to seamlessly integrate tech within replicas which have all the detail and nuances of the originals. We created the Robert Burns bust using the latest 3D scanning technology, building a mould which captured every detail of the original. The mould was then scaled up to human proportions and subtle details were added to his face and hair. A hand with an in-built contactless device was then created on a separate plinth. A ‘wee, sleekit, cowrin, tim’rous beastie’ at the base of this plinth was also added, a nod to Burns’s famous poem To a mouse. Finally we applied a marble-effect finish to match the look and feel of the original. 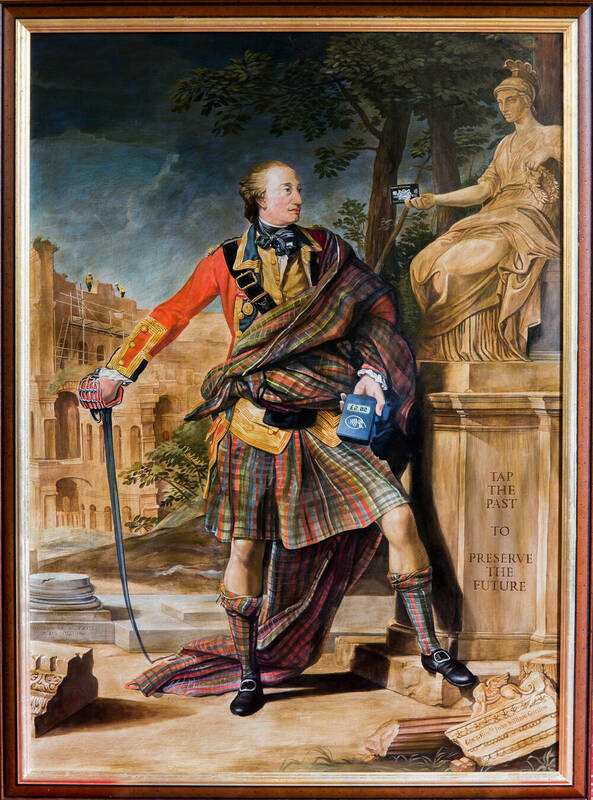 A pastiche painter with many years’ experience re-created Fyvie Castle’s most famous painting by Pompeo Batoni. Spot the subtle new details added, such as the goddess Roma holding a contactless card and of course the contactless reader, painted using 18th-century-style brush strokes, in the hand of William Gordon himself. Scottish workers in high-vis jackets are also hidden within the painting – a nod to the Trust’s tireless conservation work. Once completed, toner was added by specialists at the British Association of Paintings Conservator-Restorers, to ‘un-restore’ the painting, matching the craft of the original. We’ve been delighted to partner with Bank of Scotland and VISA on this amazing project to create these beautiful replicas and bring contactless donating to these two historic sites. We hope you can come and see these incredible replicas for yourselves soon. If not, you can always donate online to support our work, which we do for the Love of Scotland.